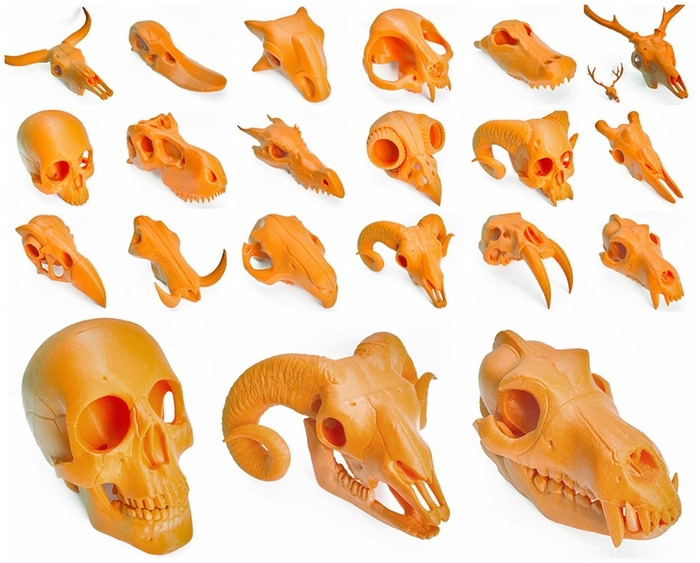 If you have a thing for 3D printed skulls, 3DKitbash is here to save your day. All you have to do is pledge a little…or pledge a lot, because, from the looks of their latest Kickstarter campaign, if its skulls you want, then skulls you shall receive. The makers of 3D printable and customizable Quin doll, 3D Kitbash, are following up on the success of their earlier project Boneheads, from 2014, by taking 3D printed skull designs to the next level with Boneheads 2. As with the first project, the idea was to re-create skull designs from their original skull-kits that could be printed by anyone with a FFF/FDM desktop 3D printer. It meant painstakingly remodeling the designs, that were initially well-suited for SLS printers, to retain the features and overall look, even when printed without supports in FFF/FDM. Challenging indeed! Boneheads had a project goal of $500 for their first eighteen 3D printed skulls, which were divided into 3 series, and it was thumping success, eventually receiving $6,454 in total. This time, they’re returning with eighteen new and significantly revamped skulls, also divided into 3 series. The most special thing about the skulls from Boneheads 2 is that, now the skulls can talk! Each and every skull design will have an articulated jaw. “Because everything is better with a mouth,” according to 3DKitbash. As with the first project, Boneheads 2 has a series of ‘Stretch Rewards’, which mean that the further they exceed their set goal, the more you stand to receive beyond what you pledged for. Among other things, you could get a unicorn skull or, even better, a killer whale skull – neither of which are part of the original series. This time, branching away from the usual creature noggins, there’s a fantasy skulls series that features cyborgs, goblins, and fairies. All skulls can be 3D printed reliably, most within a 100mm X 100mm build platform, and can be mounted using the 3D printable base provided in each set (a process outlined in the video below). Boneheads 2 is running until May 16th so head right over to their Kickstarter page to take your pick of 3D printed skulls and contribute to the great work being done by Quincy Robinson and Natalie Mathis at 3DKitbash.